Subjects like war and peace go through a special treatment when perceived by a poet, and we at BLF were privileged to have four poets share their poetry on the subject. Verses flowed on a diverse set of topics related to the subject. The windy weather at the venue perfectly complemented the feel to this poetry session. 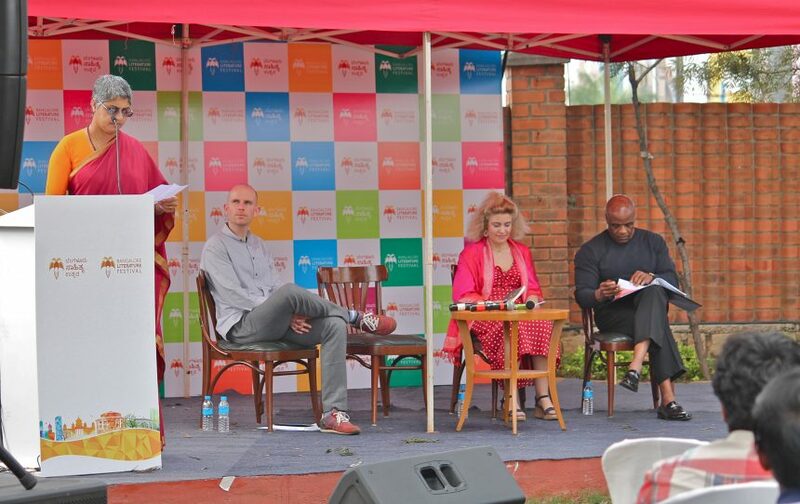 The session started with poems read aloud by Per Bloch, a writer and musician from Denmark. His session showed a soulful mixture of poetry and music, making it a kaleidoscopic performance. Bloch spoke about his music, a work titled the Queen of Hearts. He created an amalgamation of lyrics and music. The music was poetic by itself as it was a juxtaposition of different sounds, like goat bells, a church orchestra and his sister playing the harp, to name some. Mani Rao graced the stage with five of her poems. The first one that she read out was called Love Poem. It was full of imagery, being poetic and matter of fact at the same time. “The songs we like are the songs we know and every song on the radio is about us” was one of the beautiful lines from the poem she read. Another poem she read was called Fated which was about what Odysseus would do when the war is done. Poems on justice, liberty and true freedom took centre stage with poet Neal Hall. His voice commands attention and is just as powerful as his words. This Harvard and Cornell University graduate showed the irony of the term liberty in the free world. His poems had overtones of American history, especially focusing on the emotions of a person of African-American descent. “As an African-American, my entire life has been about war for peace,” said Hall. These meditations on war and peace gave the audience many fresh perspectives on the issue.